Kenya – Kenya's Kids in Need, inc. 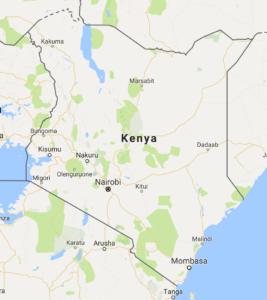 The Republic of Kenya, established 1963, is a founding member of the East African Community (EAC) and borders Somalia, Ethiopia, South Sudan, Uganda, Tanzania, and the Indian Ocean. Kenya is home to over 45,000,000 people consisting of 7 unique ethnic groups and other nationalities. Nairobi is the capital of Kenya and home of 3.3 million people. Close to half of those people live in informal settlements, areas characterized by a lack of basic services, land tenure, and permanent housing. Urban Development and gentrification are forcing Nairobi natives to settlements further and further way from public services and into informal settlements such as Kayole-Soweto and Thogoto. Structures with an average of two 10 by 10 sq. ft. rooms are often made of timber, iron sheets and cement. A few stone houses exist but are mainly occupied by the structure owners who typically oversee 10 tenants. Rent range from Kshs. 300 to 1800 depending on the quality of the house and services provided. Structures have unreliable access to electricity and have to carry water in from community hydrants for between 2/- and 3/- Kshs. per 20 liters. With no sewer line connections, communities rely on pit latrines but those also have a cost 5/- Kshs. per use. Open drainage channels are maintained by residents but are constantly blocked by solid waste and over flows into the surrounding structures. Most residents engage in casual unskilled and semi-skilled jobs and self-employment in small scale enterprises earning up to Kshs 200 ($20 USD) per day while a few are on formal employment. Unemployment and crime are common concerns in the area.